St. Francis Xavier Basilica in downtown Dyersville! Although Dyersville, Iowa, the first weekend in November is all about the National Farm Toy Show, each year I don’t feel like the trip was complete without a visit to the glorious St. Francis Xavier Basilica. Only one of 53 Basilica’s in the United States, this lovely Catholic Church literally takes your breath away. The definition of a Basilica is a church of unusual architectural and spiritual significance and is often referred to as the Pope’s church. The Basilica in Dyersville holds it title by a special Papal edict. Open daily, the church has twin spires and 65 stained glass windows. The church is a beautiful example of Medieval Gothic architecture. In Bible study this morning, at the Lutheran church I attend, ladies were expounding on recollections of moments when they could feel a special closeness with the Lord, walking through this awe inspiring chapel does it for me. The stained glass windows, the terrazzo floor, the butternut wood confessionals and the decorative paintings all serve as reminders of the Glory of God. Building began in 1887 and the church was dedicated on December 3, 1889. 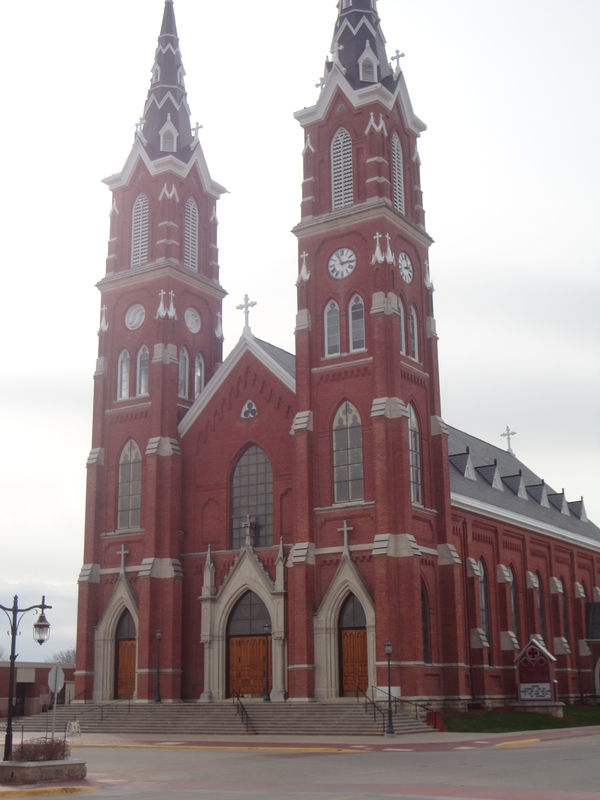 If ever in Dyersville, Iowa which is also known for the Kevin Costner movie The Field of Dreams, take the time to stop downtown and pause inside the heavy wooden doors and revel in silence for a reverent moment or two inside the glories St. Francis Xavier Basilica.